If you follow me on any of my social channels you know that I am that woman that drives around with a car full of kids every single day. Being lucky enough to have my grandkids near me is something that I don't take for granted. I have been very lucky in being so close to them, that sometimes I want a vacation from them, just kidding! Truthfully, we are a very close family and we are always together. During the weekdays it's after school programs, sports and errands, and on the weekends it will be more sports and some roadtripping. I've had a car full of kids with me since my early 20's when my girls were little, so I am pretty good about knowing what to always have on hand so that anywhere we happen to be going, everyone is happy. My car always has a blanket, books, electronics and a snack bag filled to keep the kids comfortable. Hangry kids make for: angry, fussy children and that is something to be avoided at all times, especially when you have so many of them with you. As any mom will tell you, having snacks-on-hand is a must! 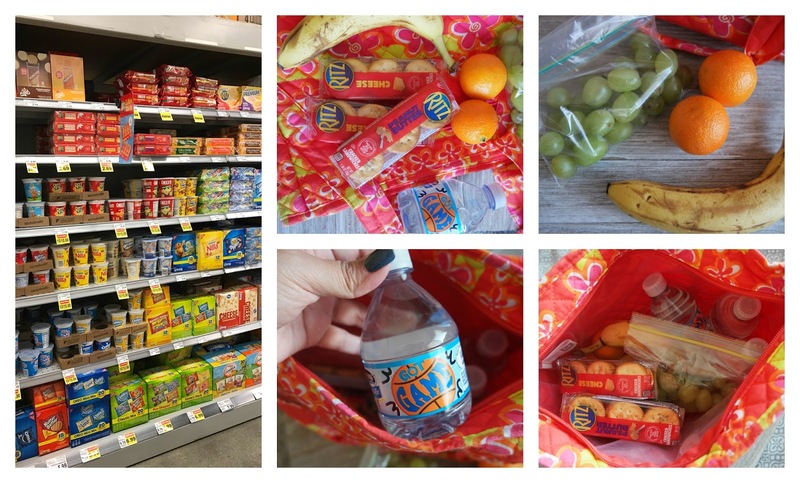 It only takes a few minutes to prepare a snack bag to take whenever you're out with kids. Let me show you how easy it is! RITZ Filled Sandwich Crackers are now available at Kroger stores (Food 4 Less and Ralphs in our area) which means I can easily pop in for a few boxes on our way out of town if I happen to be out at home. RITZ Filled Sandwich Crackers are a favorite of the entire family, and I can never seem to keep enough on hand. I also pick up some fresh fruit and child sized waters, which are more appealing to kids and make giving them water easier. Now that I am stocked up I can pack the weekend snack bag to keep hangry kids away. RITZ Peanut Butter Filled Sandwich Crackers and RITZ Cheese Filled Sandwich Crackers are always first in my snack bag. The kids love them and they really pack a punch at keeping hunger at bay. fresh fruit is another must have and a great way to get more fruit into the kids. Sometimes they won't eat fruit at home, but when we're out and they are hungry, you bet they go for that fruit like they haven't eaten all day. I always pack smaller water bottles for them because our temps are very high and the kids immediately get thirsty. Purchasing smaller bottles is more appealing to kids so I don't mind paying a little more to ensure they drink a lot of it. With RITZ Cheese Filled Sandwich Crackers it's easy to turn that frown on a hangry kid upside down. These sandwich crackers are easy to take on-the-go and make my life so much easier. This weekend we stood for over 2 1/2 hours waiting for the tree lighting at The Grove LA and you can bet these are what saved my life. Hangry Kids? Not no more! This mom and grandma does not have time to deal with meltdowns or unhappy, hangry kids, there's too much to do! That's why I like to be prepared and Food 4 Less gives me the goods to do so, at a great price. What are some of your tips for dealing with Hangry kids?